It is not easy to meet Sayed Parwiz Kambakhsh in prison. He is condemned because of blasphemy and any one who dares to meet him, has the perspective of being questioned or followed by police man, inside the prison. "Visitors who are visiting Kambakhsh will be followed by police because they are controlling Kambakhsh's relations outside of the prison". I was already told that by a friend of mine, who is a police officer. It was almost 11:00AM, at least one hour left to meet the prisoners; I had to meet Parwiz Kambakhsh to let him know that he is the winner of the Freedom of Expression award in Italy. Standing in line for minutes where hundreds of people waited just the same to meet their relatives, imprisoned. At the gate of the prison a police man with a board marker signed visitor's hands, next door the visitors have to deliver their mobiles phones and knives. Before approaching the meeting room for the prisoners, there are two check points, one where stamps were put on the visitors hands and the last one is the control to make sure the visitor doesn't carry something that can be dangerous or suspicious. 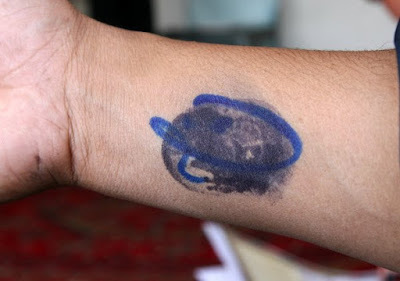 My right hand was signed by a big marker and stamped at the last check point before entering into the prison. The salon is terribly noisy, you can't hear even your own voice. Visitors are shouting to the prisoners and prisoners shout to visitors. The guy who called the prisoners is called "Jarchi" (Farsi). It was the second time I asked him to call Sayed Parwiz Kambakhsh, and then immediately he appeared. I waved to him and went a step closer behind the bars but the reticulated wall of metals didn't allow me to touch his fingers. He seemed disappointed and desperately waved at me. Only for a few seconds I got closer to him, closer to hear him, which was difficult because of the noise. Suddenly my left shoulder was pulled back roughly and I saw two policemen who asked me what I was telling to Kambakhsh. The police men didn't allow me to get closer to him anymore. But I had a chance to tell Mr.Kambakhsh about the prize, that he become a winner by the Information Safety and Freedom award (ISF) in Italy. He expressed his feeling to be happy to hear that, but the final words I heard from him were: "I need help to get out of the prison." The police men didn't give me another chance to talk with him anymore, so I waved to him and promised to spread his message outside. The Italian version already published here.